While we're celebrating successes, on Monday, the relaunched Reason Network also went live. I can take a little credit for this one: a humble Wordpress site that I inherited from my illustrious predecessor, in need of a serious functional and cosmetic makeover. 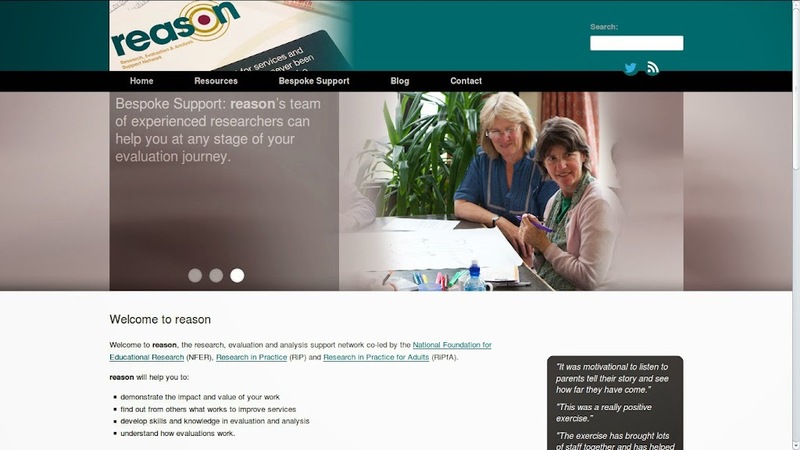 Jointly run by Research in Practice www.rip.org.uk and the National Foundation for Educational Research (NFER) http://www.nfer.ac.uk/, reason is the extension of the two organisations for research, evaluation and analysis support in children's services and education. The previous site was a dated morass of BuddyPress themes and plugins, a jumble of pages and a look and feel that was so 1996, my father could have built it. The key part of the brief for developers Bigpig Web Design was to add a shopping cart to turn the reason site into an on-line shop. Incompatibilities with the old plugin's meant we were forced to re-theme and re-structure the entire site. This was my very welcome cue to pull through into a Wordpress theme some common design elements from the Research in Practice site, elements which will inform all of the work for Research in Practice web presence for the foreseeable future. Between us, we've put together a site that one of our project champions says " The site looks great btw! It screams 'modern' and 'quality' to me!"